South Norway is a region of Norway. 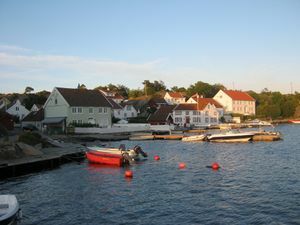 The coastline is famous for it's beautiful archipelago and white-painted wood towns, and is a favorite vacation area for Norwegians in the summer. It's pretty easy to travel between the coast towns. Outside the towns, however, public transport is rare. The inland is far less visited, but those interested in trekking to beautiful solitary lakes or whitewater activities - or mosquitoes - should give it a try. Those interested in dialects, can observe the remarkable change up north along Setesdal, from the Danish-sounding Kristiansand dialect, to the very different north valley dialect that sounds more like Gaelic. In several inland municipalities, a writing form of Norwegian usually associated with West Norway known as Nynorsk is the official form. Closer to the coast, the general rule is that people tend to speak a dialect more and more similar to East Norwegian dialects the further east you travel. East of Tvedestrand, a rolling r is applied while western areas use the voiced uvular fricative like in French and German. There is one major airport South Norway: Kristiansand (IATA: KRS).There are scheduled flights to four domestic destinations as well as Alicante, Amsterdam and Copenhagen. Connecting bus and coach services operate to Kristiansand, Lillesand, Arendal and Grimstad. Coach connections to Oslo and the towns along the western shore of the Oslo Fjord is excellent. Nor-Way Bussexpress  has 9 daily connections between Kristiansand and Oslo, Konkurrenten.no between 4 and 7 departures while Lavprisekspressen runs twice daily. You are guaranteed a seat - if the bus is full, the bus company will add an extra bus. Lavsprisekpressen provides online ticketing only. These express buses are usually just as fast as the trains to Oslo. To towns like Larvik, Tønsberg and Sandefjord you might arrive several hours later if you go by train. There's also infrequent express bus connections to Stavanger and up along the Setesdalen, with connections to cities such as Bergen and Haugesund. Regional buses run frequently along the coast, from Lyngdal and Lista in the west to Arendal in the east, run by several different bus companies. The ferry companies Fjord Line  and Color Line  operate car ferries to and from Hirtshals in Denmark, 2 times each day (3 times in the high season). The trip takes 3 hours and 15 minutes, with the Color Lines Superspeedferry whereas Fjord Lines HSC Fjord Cat completes the journey in just 2 hours and 15 minutes. Prices soar in the summer. The E18 is the main road between the area and Oslo. The road changes its name to E39 when it passes Kristiansand on its way to Stavanger. Route 9 starts in Kristiansand and takes you through the natural beauty of the Setesdal Valley to Haukeligrend on the Hardangervidda (Hardanger Plateau). Regional trains connect Kristiansand to other cities and towns along the Southern Railway Line (Sørlandsbanen). Up to 8 trains daily depart for Stavanger, while up to 6 daily trains leave for the country's capital, Oslo. The trip to Stavanger takes about 3 hours and the trip to Oslo between 4 1/2 to 5 hours. Trains both westwards towards Stavanger and eastwards to Oslo follow an inland route, meaning that travel to the towns along the coast is quite inconvenient by train. There are lots of nice forest views and rural settlements, though. The train station is situated right next to the town centre, the ferry terminal, and the bus terminal. In Kristiansand you may get into trouble if you try real hard. If you travel by boat or in the winter mountains, make sure you know what you are doing. Otherwise, nothing of danger. Usually either directly to Kristiansand or via Oslo or Stavanger. This page was last edited on 8 August 2018, at 09:17.